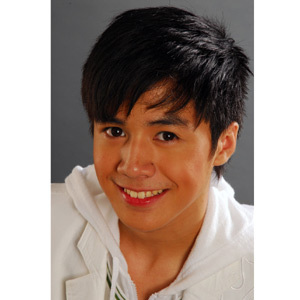 Sam Concepcion (in photo) will sing "Kung Fu Fighting," the theme song of Kung Fu Panda. This animated comedy features the voices of Jack Black, Seth Rogen, Jackie Chan, Dustin Hoffman, Angelina Jolie, and Lucy Liu. Fifteen-year-old pop star and theater actor Sam Concepcion will collaborate with Dreamworks and United International Pictures (UIP) to sing the theme song of their newest animated comedy, Kung Fu Panda. This makes Sam the first Filipino to work with Dreamworks for this project. Oliver Oliveros, Senior Public Relations Officer/Consultant of STAGES, explained: "Sam Concepcion has been chosen to sing the theme song 'Kung Fu Fighting' for the Philippine release of the Dreamworks-United International Pictures' Kung Fu Panda. It will be screened in the Philippines this June. "Dito sa Pilipinas, yung particular track na iyon na papatugtugin sa credits, si Sam ang kakanta. In addition to that, may kasama pa siyang music video, which will be directed by Marie Jamora. "They had several artists in mind before, tapos si Sam ang nakakuha ng part. For the region, iba-ibang artists ang kakanta ng 'Kung Fu Fighting,' which was originally released in 1974. Sam was asked to audition to make sure that Sam fits the role. His song will be used for the promo here in the Philippines." Ceelo Green, an America hip-hop and R&B artist, sings the theme song for the original U.S. Kung Fu Panda soundtrack. Korean pop icon Rain, best remembered by Filipino audiences in his drama series Full House, will also record the same song in his native language. Kung Fu Panda is about Po the Panda (voiced by comedian Jack Black), a waiter in a noodle restaurant who is a kung-fu fanatic. The panda is considered as the laziest animal in ancient China's Valley of Peace. But through a sudden twist of fate, he is named as the "Chosen One" who must battle evil warrior Tai Lung (voiced by Ian McShane) who escapes from prison and threatens the pandas' way of life. A kung-fu master named Shifu (voiced by Dustin Hoffman) helps Po the Panda by training him along with the legendary Furious Five, who will also borrow celebrity voices: Master Monkey (Jackie Chan), Master Tigress (Angelina Jolie), Master Viper (Lucy Liu), Master Crane (David Cross), and Master Mantis (Seth Rogen). Sam's new video for "Kung Fu Fighting" and the animated comedy Kung Fu Panda hits the theaters this June.